Last weekend, my husband and I decided to take a short road trip to the Haines Shoe House located in Hellam, Pennsylvania, along the historic Lincoln Highway. I've known about the house for years. In fact, I once stumbled upon it during my travels and attempted to gain entrance, only to discover it was closed for a private group tour. That was several years ago, so sitting around with nothing to do (for a change) on a sunny Sunday, we thought we'd give it another shot. We arrived at 197 Shoe House Road in York, Pennsylvania around 1 p.m. There was plenty of parking in the little lot surrounding the unique house that is situated among lush fields and rolling hills, with a few houses located across the way. One of the first items we spotted was an adorable little miniature version of the main house, which on further inspection turned out to be a canine residence. The backyard features a dog house in the shape of a shoe. The Haines Shoe House is an example of what is called mimetic architecture--also known as "novelty" architecture, which was popular in the first half of the 20th century. I've always been fascinated with mimetic architecture and plan to write more about such buildings in the future. More recently I discovered these buildings were also known as "ducks." Might that be where the phrase "he's an odd duck" originates? One can only surmise. Anyway, here's the article I found on one of my favorite blogs called "Restaurant-ing through History." You can read more about "ducks" here. I took a few pictures of the outside of the house then walked inside the little ice cream shop located on the first level. All eyes seemed to be upon me, as if to say, "It's about time." I can blame hubby for this since he entered before I was done shooting pictures and it appears that I was holding up a tour. The good thing about being "late" to the scene however, is that we were off to the races pretty quickly. Within just a few minutes our tour began. 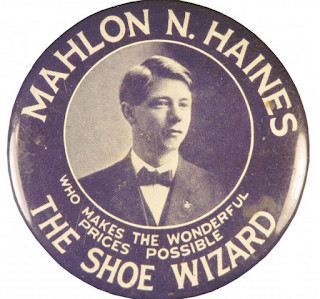 Mahlon Haines was born in Old Washington, Ohio on March 5, 1875. A fellow Marchie--and eccentric "to boot," go figure. Haines lost his dad when he was but an infant and as a young man went to work at his mother Elizabeth's department store in Washington, DC. Elizabeth was ahead of her time, running the largest American department store owned and operated by a woman. With these proceeds, she was able to fund her son's education at Maryland Agricultural College (now the University of Maryland). Haines then became a corporal in the campus military organization, according to the University of Maryland archives, but his college career lasted a mere two years. According to some accounts, Mahlon asked to be made a partner in his mother's store and when she denied his request, he took off for California, worked for a few years there as a clothing rep and eventually moved back to Ohio to marry his sweetheart. Mahlon didn't seem to be having much luck in the interpersonal relationship department those days, because that, too, fell through, causing him to pack up, hop on his bike and journey back home, presumably to dine on a little crow and request that mumsy re-hire him. He made it as far as York, Pennsylvania when his trusty transportation bit the dust and he was forced to rely upon his ingenuity to extricate himself from a precarious position. The first thing he did was sell the engagement ring intended for his beloved. He then parlayed the proceeds into 10 pairs of shoes, which he promptly sold at a farmers' market and from those humble beginnings, the Haines shoe empire was born. 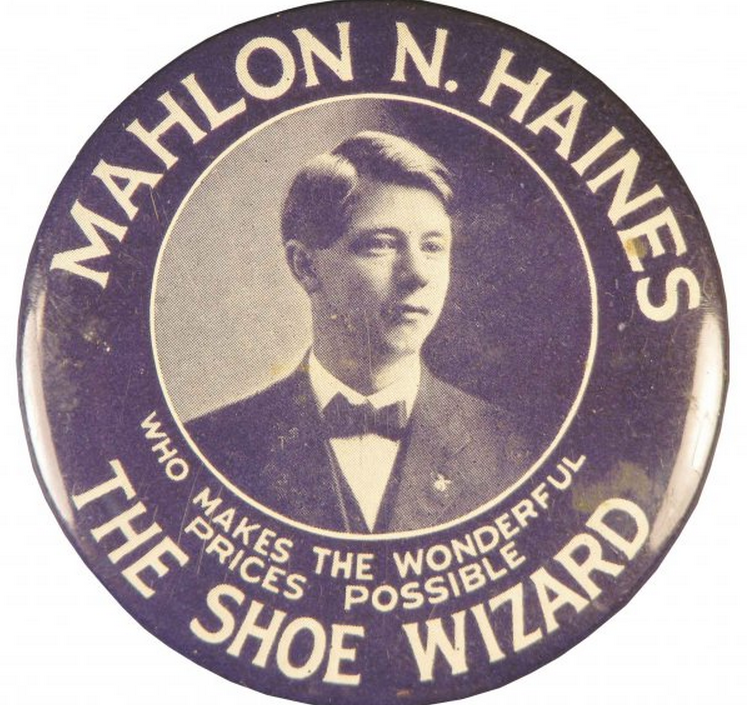 Over the years, the eccentric businessman turned the "shoe business" into "show business" with his marketing exploits. He is said to have walked a tightrope between two of his stores, handed out scads of advertising fans at churches (which hang on the walls of the house) and rode around town with a cart pulled by an ox painted with the words "Haines Shoes from Hoof to Hoof." By 1935, Haines had amassed 50 shoe stores in Pennsylvania and Maryland and in 1948, the freewheeling businessman decided it was time to embark upon a more ambitious attention-grabbing marketing ploy. This time the self-proclaimed "Shoe Wizard" would build a house visible from the main road on the Lincoln Highway East in the likeness of his best-selling boot. The 48-foot-long, 25-foot-high structure took nine months to build and Haines lived in the house for a short while before moving to a another property. The five-level house contains three bedrooms, two bathrooms, a kitchen and a living room. The guide told us this was the maid's quarters, although it's difficult to imagine fitting a bed in there. Haines was known as a very generous philanthropist and treated honeymooners and elderly couples to free stays at the shoe house, complete with butler and maid. The businessman was known for sharing his wealth with the community and was active in organizations like the Boy Scouts. 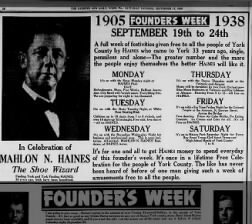 Here is just one example I found of how Haines gave back to those who lived in the York area. He took out this ad celebrating himself (which I found amusing) by paying for a week's worth of festivities that included free refreshments, ice skating, dancing, music cakewalks and fireworks. About 10 years before his death, an article ran on August 16, 1952, in the Gettysburg Times. It provided the reader with a glimpse into Haines' political beliefs and his plans for the future. In it, he says, "I have given enough money to be squandered and spent in wars and wars, killing off and hospitalizing the finest young men in the world. So from now on I am giving the profits of my great chain of shoe stores to my customers and employees." He then lowered prices on all of his shoes and vowed at the end of each year to give "other" money to his faithful employees, that is, he added, "if our un-American government controls will allow me." Haines passed away in 1962 and left the house to his employees, but his memory lives on. In 2015, Melanie and Jeff Schmuck purchased the home and they continue to share their love of the structure with the public through tours and an old-fashioned ice cream parlor. After the sale, a local newspaper reported the Schmucks as saying, "It was like we were given the keys to the Wonka Factory." To learn more about tours, prices and times, visit their website at http://www.hainesshoehouse.com/.